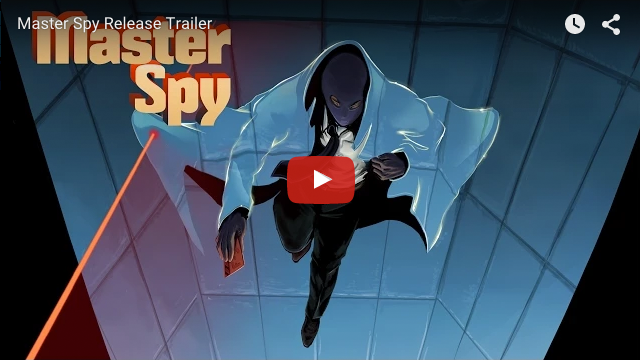 Master Spy is out on Steam! Pre-orders are available at http://masterspygame.com. 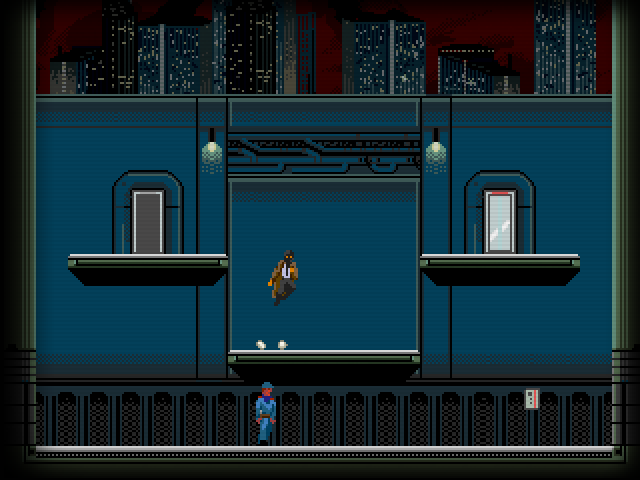 The idea behind Master Spy is simple - use your cloaking suit and agility to evade obstacles to grab the keycard and make it to the locked door. Simple, right? Except as you progress, a hoard of enemies and obstacles lie in wait - ranging from guard dogs to assassins to security drones - ensuring that the task at hand won’t be easy. The goal is to have 5 missions, each set in distinct locations, with 10 levels each. We have over 20 obstacles and enemies planned, each with unique mechanics, to keep the game varied and challenging. 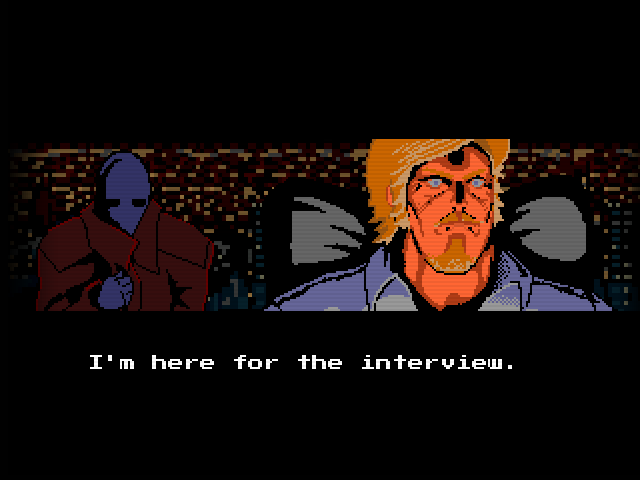 One of the features of the game is cinematic pixelart cutscenes, which will tell a story of action, conspiracy, betrayal, and intrigue. If it's not your thing, you can always skip them. TurboGun is John Coxworth (Art) and Kris Truitt (Dev), a two man team working on this in our spare time. We've brought Sferro on board for a cool 80s/synth-based OST. Creating the demo forced us to focus on a lot of the little things that will help us out in the long run. The cutscene engine is fairly complete, probably needing a few tweaks as we go along. We still have a ways to go - refining levels, creating more art, enemies, and levels for the later part of the game, and implementing menus/save games. We hope you dig what we've got so far! I remember seeing this on one of the Screenshot Saturday threads on reddit a few weeks back. Nice to see all the gifs here together at once. Looking good! Looks good, I like the city backgrounds with all the flashing lights, the white/yellow rooms are my least favorite, but still ok. I love the look! Also the concept is pretty cool. I am a sucker for 2D stealth stuff. Question about the game, how are you planning distribution via Steam, since the game is HTML5? Tiger is the best security system. Seriously, this looks awesome and is coming together nicely. Keep it up! Good question! The current plan is to use Node-Webkit, which lets us package it as an downloadable executable for Windows and Mac (and Linux too, but I haven't tried that out yet). I actually tested this out early on, to make sure HTML5 was feasible, and it works really well - I even recently tested it out with x360ce to see if I could get my PS2 Dualshock to work with it (which was pretty rad!). One downside is a little overhead in the file size, since it's pretty much packaging chromium with it, but it's not bad when zipped up. Cool! That's actually what I have been using as well, I was mostly curious if you had a found different solution, as node-webkit was by far the best one I found (after lots and lots of searching). The cloak looks really cool party see through, good idea for a game, curious to see how it plays out. I love the graphic style, but maybe something like scanlines would hep a bit. Retro games had the advantage of TV scanlines to make smoother graphics at no cost. These scanline could be a little stronger. If you take a lot of the great pixel games of the past, you realize they don't look that great when you remove the scanlines. Cool - yep, have played a few older games blown up on LCD screens - some degrade better than others, but they're definitely missing something from the old tube TV days. I'll experiment with it a bit more to see if we can get it to look better. Thanks! I think I saw this game in Greenlight. I remember thinking it's a wasted opportunity that the coat of the player character is not more lively animated during gameplay. It's just a personal favourite pet detail of mine that I get excited over - nothing objective about this opinion of mine! Cool - do you mean more bounce in movement/more billowing/fluttering of the jacket/an idle animation? Might be something we look into a little more as we progress, to see how it fits. Thanks for the feedback! do you mean more bounce in movement/more billowing/fluttering of the jacket/an idle animation? Fluttering, I'd say. Sort of trailing behind the character as it moves. Fluttering trench coats are just something I get my kicks from. It also does give opportunities for nice idle animations. That architecture looks great & crazy! I love that 70's "villain's mansion" feel you got here.